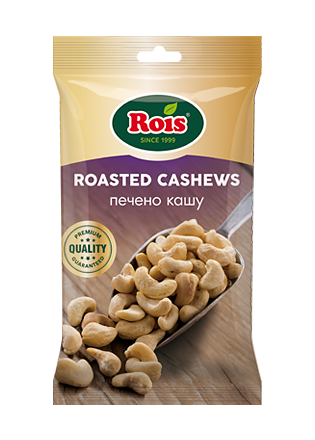 INGREDIENTS: cashew, sea salt, modified starch. Packaged in a protective atmosphere- nitrogen. The product may contain traces of peanuts and other tree nuts. 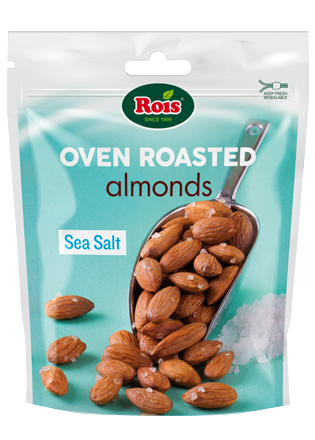 INGREDIENTS: almonds, sea salt, modified starch. Packaged in a protective atmosphere- nitrogen. The product may contain traces of peanuts and other tree nuts. 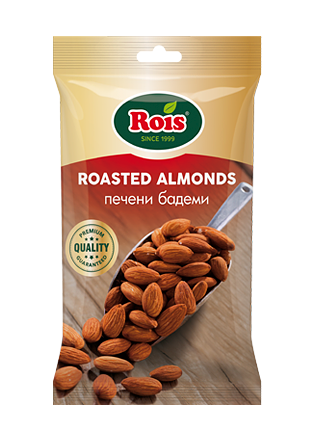 INGREDIENTS: almonds, salt, modified starch, acidity regulator: citric acid. Packaged in a protective atmosphere- nitrogen. The product may contain traces of peanuts and other tree nuts. May contain shells or shell fragments. 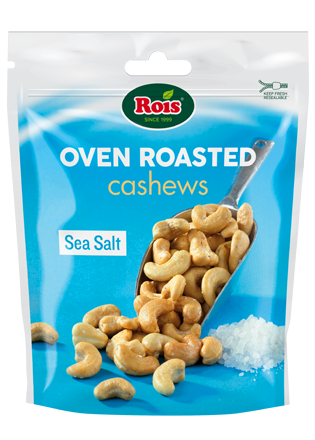 Ingradients: cashew, salt. Packaged in a protective atmosphere- nitrogen. The product may contain traces of peanuts and other tree nuts. 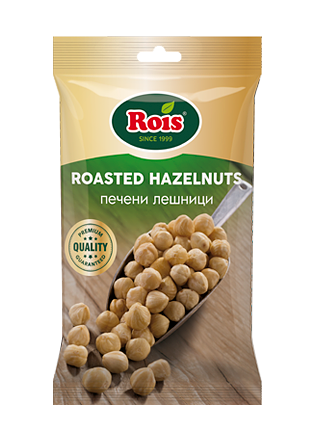 INGREDIENTS: blanched hazelnuts. Packaged in a protective atmosphere- nitrogen. The product may contain traces of peanuts and other tree nuts. 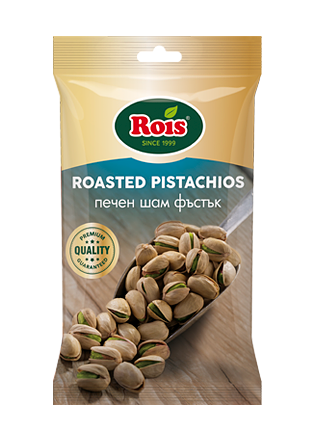 INGREDIENTS: pistachios, salt, acidity regulator: citric acid. Packaged in a protective atmosphere- nitrogen. The product may contain traces of peanuts and tree nuts. 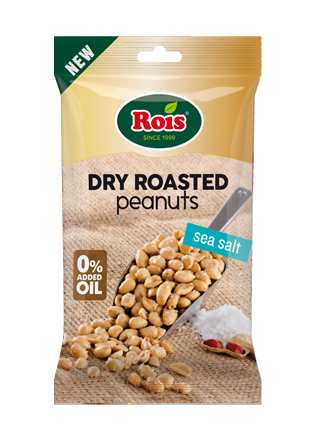 INGREDIENTS: peanuts, salt, wheat flour, acidity regulator: citric acid. Packaged in a protective atmosphere- nitrogen. The product may contain traces of tree nuts. 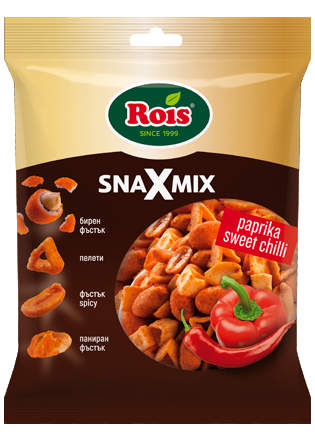 Mix of coated peanuts, oven roasted peanuts and potato snack with spicy paprika and sweet chili flavour. 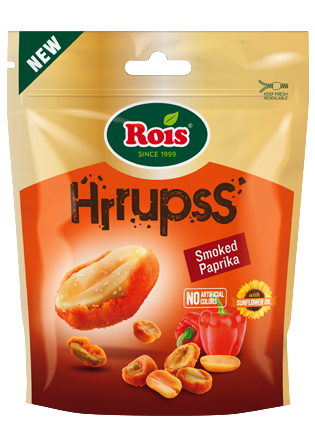 INGREDIENTS: peanuts, corn starch, modified starch, wheat flour, potato starch, potato granules, maltodextrin, sugar, salt, glucose, hot paprika, onion, paprika, acidity regulator: citric acid; cumin, anti-caking agents: tricalcium phosphate, silicon dioxide; colour: paprika extract; flavour enhancers: monosodium glutamate, disodium guanylate, disodium inosinate; arabic gum, raising agent: ammonium carbonate; flavourings. Packaged in a protective atmosphere- nitrogen. The product may contain traces of tree nuts, soy, milk and mustard. Ingredients: peanuts, corn starch, modified starch, sunflower oil, maltodextrin, salt, hot paprika, onion, garlic, sugar, citric acid, cumin, colour: paprika extract; arabic gum, flavourings. The product may contain tree nuts, milk, gluten and mustard. 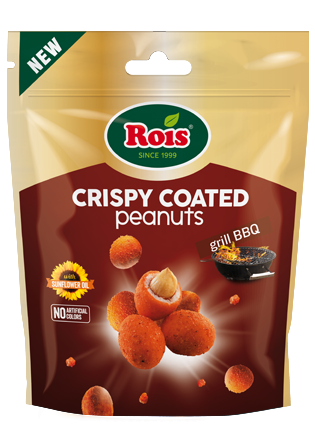 Ingredients: peanuts, corn starch, modified starch, sunflower oil, maltodextrin, sugar, salt, onion, mustard, flavour enhancers: monosodium glutamate; colours: curcumin, paprika extract; citric acid, honey, silicon dioxide, flavourings. Packaged in a protective atmosphere- nitrogen. The product may contain tree nuts, gluten and milk. 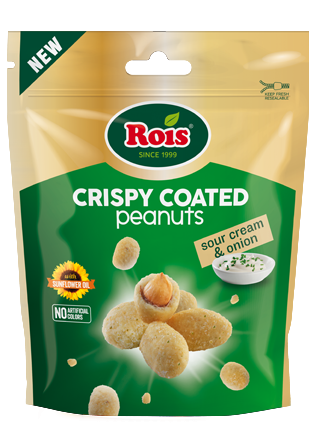 Ingredients: peanuts, corn starch, modified starch, sunflower oil, maltodextrin, salt, sugar, onion, garlic, flavour enhancers: monosodium glutamate, disodium guanylate; cheese, whey powder, coconut oil, parsley, silicon dioxide, citric acid, potassium phosphate, sodium phosphate, colours: carotenes, anato; flavourings. The product may contain tree nuts, gluten and mustard. 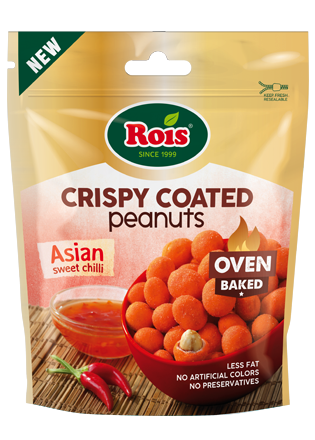 Ingredients: peanuts, corn starch, modified starch, sunflower oil, maltodextrin, salt, sugar, wheat flour, onion powder, paprika, autolysed yeast, yeast extract, paprika spice extract, garlic powder, citric acid, smoke flavouring. Packaged in a protective atmosphere- nitrogen. The product may contain tree nuts, milk, soy and mustard. 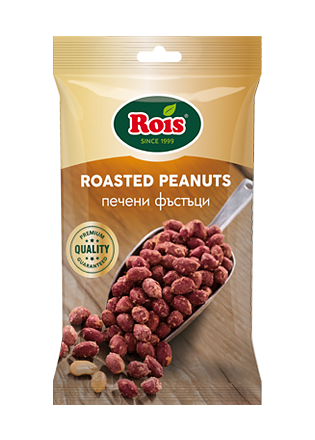 Ingradients: peanuts, modified starch, corn starch, potato starch, maltodextrin, sugar, sunflower oil, salt, onion powder, garlic powder, wheat flour, chili, spices, spice extracts, hydrolyzed soy and maize protein, dextrose, citric acid, colour: annatto.The product may contain tree nuts, milk and mustard. Ingredients: penuts, modified starch, wheat flour, maltodextrin, sugar, sunflower oil, salt, flavour enhancers: monosodium glutamate, disodium guanylate, disodium inosinate; glucose, spices, hydrolyzed milk and soy proteins, acidity regulator: sodium diacetate; emulsifier: mono and diglycerides of fatty acids; flavourings, colour: annatto. Packaged in a protective atmosphere- nitrogen. 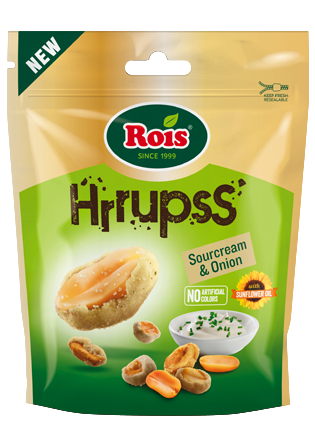 The product may contain tree nuts and mustard. 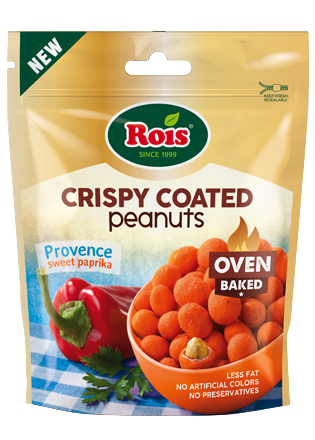 Ingredients: peanuts, modified starch, wheat flour, maltodextrin, sugar, sunflower oil, salt, onion powder, paprika, autolysed yeast, yeast extract, paprika spice extract, garlic powder, citric acid, smoke flavouring, colour: annatto. Packaged in a protective atmosphere- nitrogen. The product may contain tree nuts, milk, soy and mustard. 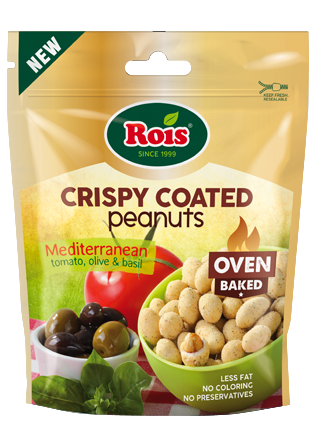 Ingredients: peanuts, modified starch, corn starch, potato starch, maltodextrin, sugar, sunflower oil, salt, whey powder, dextrose, rice flour, cheese, onion, parsley, tomato, anti-caking agent: silicon dioxide; olive oil, garlic, acidity regulators: citric acid, sodium phosphate; herbs, basil, flavourings. Packaged in a protective atmosphere- nitrogen. 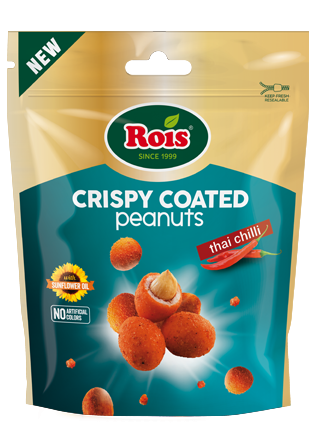 The product may contain tree nuts, soy, gluten and mustard. 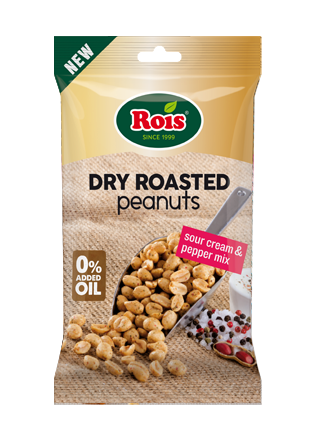 Ingredients: peanuts, modified starch, corn starch, sunflower oil, potato starch, maltodextrin, sugar, salt, wheat flour, flavour enhancers: monosodium glutamate, disodium guanylate, disodium inosinate; glucose, spices, hydrolyzed milk and soy proteins, acidity regulator: sodium diacetate; emulsifier: mono- and diglycerides of fatty acids; flavourings, colour: annatto. Packaged in a protective atmosphere- nitrogen. The product may contain tree nuts and mustard. 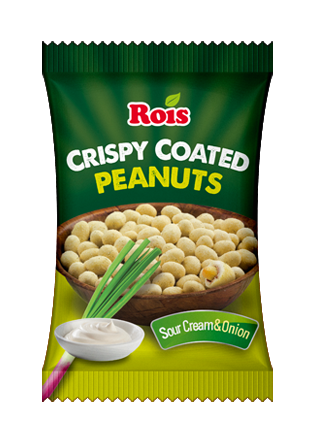 Ingredients: peanuts, modified starch, corn starch, sunflower oil, potato starch, maltodextrin, sugar, salt, onion, garlic, flavour enhancers: monosodium glutamate, disodium guanylate; cheese, whey powder, coconut oil, parsley, silicon dioxide, citric acid, potassium phosphate, sodium phosphate, flavourings, colours: annatto, carotenes. Packaged in a protective atmosphere- nitrogen. The product may contain tree nuts, soy, gluten and mustard. 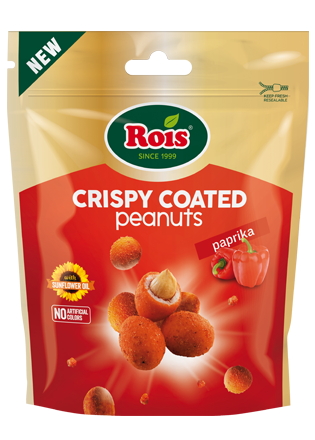 Ingredients: peanuts, modified starch, corn starch, sunflower oil, potato starch, maltodextrin, sugar, salt, wheat flour, onion powder, paprika, autolysed yeast, yeast extract, paprika spice extract, garlic powder, citric acid, smoke flavouring, colour: annatto. Packaged in a protective atmosphere- nitrogen. The product may contain tree nuts, milk, soy and mustard. 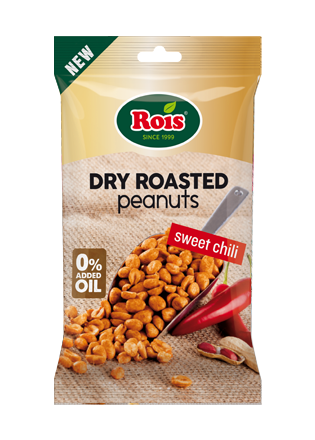 Ingredients: peanuts, modified starch, corn starch, sunflower oil, potato starch, maltodextrin, sugar, salt, onion powder, garlic powder, wheat flour, chili, spices, spice extracts, hydrolyzed soy and maize protein, dextrose, citric acid, colour: annatto. Packaged in a protective atmosphere- nitrogen. The product may contain tree nuts, milk and mustard. Ingradients: peanuts, sea salt, wheat flour. Packaged in a protective atmosphere- nitrogen. The product may contain traces of tree nuts. 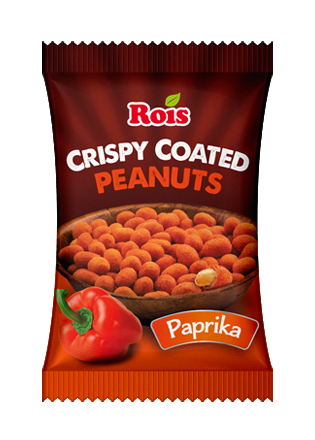 Ingradients: peanuts, salt, modified starch, sugar, glucose, onion, garlic, lactose, flavor enhancers: monosodium glutamate, disodium guanylate; sea salt, cheese, whey powder, spices, pepper, coconut oil, parsley, anti-caking agent: silicon dioxide; acidity regulators: citric acid, potassium phosphate, sodium phosphate; flavourings, colour: annatto, carotenes. Packaged in a protective atmosphere- nitrogen. The product may contain traces of tree nuts. ingradientssalt, modified starch, weath, soy, milk, surcose, glucose, maltodextrin, anti-caking agents: tricalcium phosphate, silicon dioxide; colour: paprika extract; flavour enhancer: monosodium glutamate; emulsifier: disodium phosphate; antioxidant: alpha-tocopherol; flavourings. Packaged in a protective atmosphere- nitrogen. The product may contain traces of tree nuts. 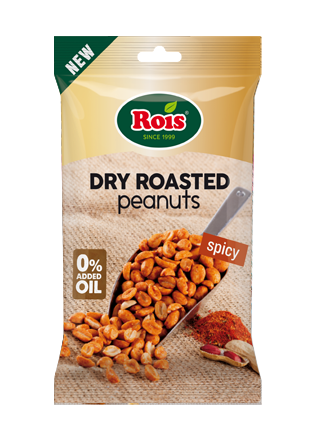 Ingradients: peanuts, modified starch, salt, hot paprika, onion, garlic, sugar, acidity regulator: citric acid; cumin, maltodextrin, colour: paprika extract; arabic gum, flavourings. Packaged in a protective atmosphere- nitrogen. The product may contain traces of tree nuts. Ingredients: peanuts, corn starch, modified starch, refined palm oil, maltodextrin, dextrose, salt, onion powder, whey powder, spices, sugar, wheat flour; flavour enhancers: glutamic acid, monosodium glutamate, disodium guanylate, disodium inosinate; anticaking agents: calcium phosphate, silicon dioxide; acid regulator: acetic acid; antioxidant: citric acid; mustard, raising agents: ammonium carbonate, magnesium carbonate; colours: anato, paprika extract; flavourings. Packaged in protective atmosphere- nitrogen. The product may contain traces of tree nuts and soy. 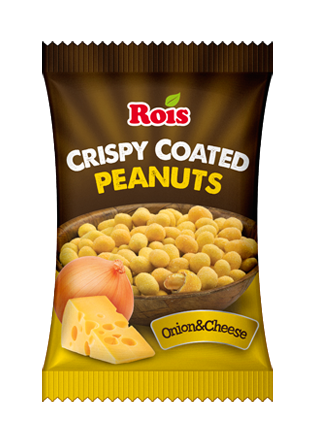 Ingredients: peanuts, corn starch, modified starch, refined palm oil, maltodextrin, dextrose, salt, sugar, onion, flavour enhancers: monosodium glutamate, disodium guanylate; cheese, whey powder, vegetable oil, spices; anticaking agents: sodium phosphate, potassium phosphate, silicon dioxide; garlic powder, antioxidant: citric acid; raising agents: ammonium carbonate, magnesium carbonate; colours: anato, beta carotene; flavourings. Packaged in protective atmosphere – nitrogen. The product may contain tree nuts, soy, gluten and mustard. 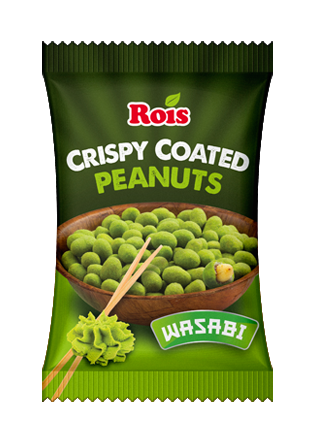 Ingredients: peanuts, corn starch, modified corn starch, refined palm oil, maltodextrin, dextrose, salt, modified potato starch, sugar, wheat flour, paprika, flavour enhancers: monosodium glutamate, disodium guanylate, disodium inosinate; anticaking agents: calcium phosphate, silicon dioxide; antioxidant: citric acid; raising agents: ammonium carbonate, magnesium carbonate; colours: anato, paprika extract; flavourings. The product may contain tree nuts, milk, soy and mustard. Ingredients: peanuts, corn starch, modified starch, palm oil, maltodextrin, dextrose, salt, sugar, soy, milk, wheat flour, spices, hydrolyzed protein, acid regulator: sodium diacetate; emulsifier: mono- and diglycerides of fatty acids; flavour enhancers: monosodium glutamate, disodium guanylate, disodium inosinate; anticaking agents: calcium phosphate, silicon dioxide; raising agents: ammonium carbonate, magnesium carbonate; colour: anato; flavourings. Packaged in protective atmosphere- nitrogen. The product may contain traces of tree nuts and mustard. 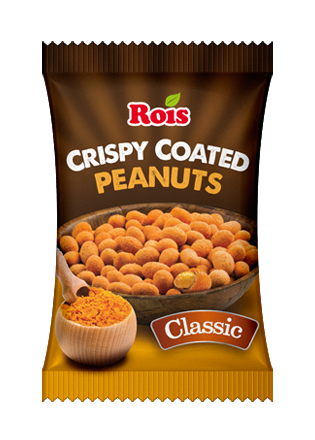 Ingredients: peanuts, corn starch, modified starch, refined palm oil, maltodextrin, dextrose, salt, sugar, wheat, soy, vegetable oil, acid regulator: sodium diacetate; antioxidant: citric acid; flavour enhancers: monosodium glutamate, disodium guanylate, disodium inosinate; stabiliser: gum arabic; anticaking agents: calcium phosphate, silicon dioxide; raising agents: ammonium carbonate, magnesium carbonate; colour; flavourings. Packaged in a protective atmosphere- nitrogen. The product may contain traces of tree nuts, milk and mustard. Ingredients: peanuts, corn starch, modified starch, palm oil, maltodextrin, dextrose, salt, sugar, onion, flavour enhancers: monosodium glutamate, disodium 5’-ribonucleotide; melted cheese powder (cheese powder, sodium phosphate); garlic powder, raising agent: ammonium carbonate; colour: beta carotene; flavourings. Packaged in protective atmosphere- nitrogen. 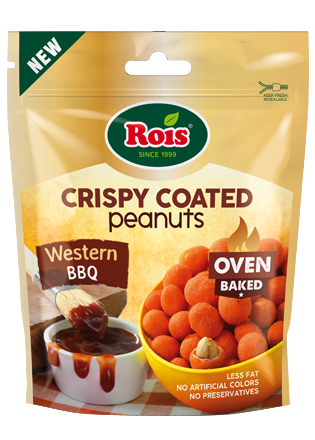 The product may contain traces of tree nuts, soy, gluten and mustard. Ingredients: peanuts, corn starch, modified starch, refined palm oil, maltodextrin, dextrose, chili pepper, salt, sugar, wheat flour, spices and spice extracts, flavour enhancers: monosodium glutamate, disodium guanylate, disodium inosinate; anticaking agents: calcium phosphate, silicon dioxide; antioxidant: citric acid; raising agents: ammonium carbonate, magnesium carbonate; colours: anato, paprika extract; flavourings. Packaged in a protective atmosphere- nitrogen. The product may contain traces of tree nuts, milk, soy and mustard.